Until quite recently it was unknown how cannabis caused its effects on the brain. Initially it was assumed that cannabinoids such as THC simply dissolve in cell membranes in the brain, thereby disrupting the function of brain cells, similar to the way alcohol makes you feel drunk. Then something revolutionary happened; in the 1990’s the human endocannabinoid system was discovered, and we learned that many of our own bodily functions are controlled by cannabis-like substances produced in the brain, immune system and other organs. In this chapter we will look in more detail at how that actually works. A receptor is a large molecule found on the surface of a cell. Here it receives chemical or physical signals from outside the cell. This is the most important way for a cell to respond to changes in its environment. Hundreds of different receptor types are found on an average cell. Each receptor type binds only certain substances. A substance that binds to a receptor is called a ligand. In general, ligands are small molecules such as a neurotransmitter (e.g. dopamine), hormone (testosterone), pharmaceutical drug (beta-blockers), toxin (from a virus or bacteria), or… a cannabinoid like THC. When a ligand binds to its corresponding receptor it changes the receptor’s setting, quite similar to how a lock requires a specific key to open it. When this happens, the received signal urges the cell to do ‘something’ that is specifically linked with that receptor, such as grow (e.g. to heal a wound), die (e.g. make place for new cells), produce chemicals (e.g. to digest food, to fight infection), or allow specific substances to enter the cell (e.g. building materials for the cell). Because the biological effect of many (pharmaceutical) drugs takes place through interaction with receptors, it makes sense that the psychoactive effects observed for THC led to the scientific hunt for specific cannabinoid receptors. This finally resulted in the identification of Cannabinoid-Binding receptor type 1 (CB-1, 1990), soon followed by discovery of a type 2 receptor (CB-2, 1993). Currently, there is even speculation about a possible CB-3 receptor, but this has not yet been fully confirmed. Cannabinoid receptors can be found all over the body, but they are more prominent in some organs. The CB-1 receptor is predominantly present in the central nervous system (brain and spinal cord), particularly in those brain regions that regulate functions we typically associate with the use of cannabis: sleep, appetite, perception of time and pain, memory etc. Overstimulation of the CB-1 receptor leads to a feeling of intoxication, also known as being ‘high’ or ‘stoned’. The CB-2 receptor is present mainly on the cells of our immune system where it can influence pain, inflammation and tissue damage. The discovery of cannabinoid receptors prompted scientists to search for its natural ligands, which should be produced somewhere in the human body. Finally, a single compound could be isolated, with a strong binding to the CB1 receptor. This compound (arachidonic acid ethanolamide) was named Anandamide, from the Sanskrit word for ‘‘eternal bliss’’. A few years later, a related compound was isolated with an affinity for both cannabinoid receptors; it was identified as 2-arachidonyl glycerol, abbreviated as 2-AG. The structures of these two compounds are shown in figure 4-1. In more recent years, a wide range of compounds with endocannabinoid activity have been isolated or synthesized. Cannabinoid receptors and their natural ligands together constitute what is referred to as the endocannabinoid system. 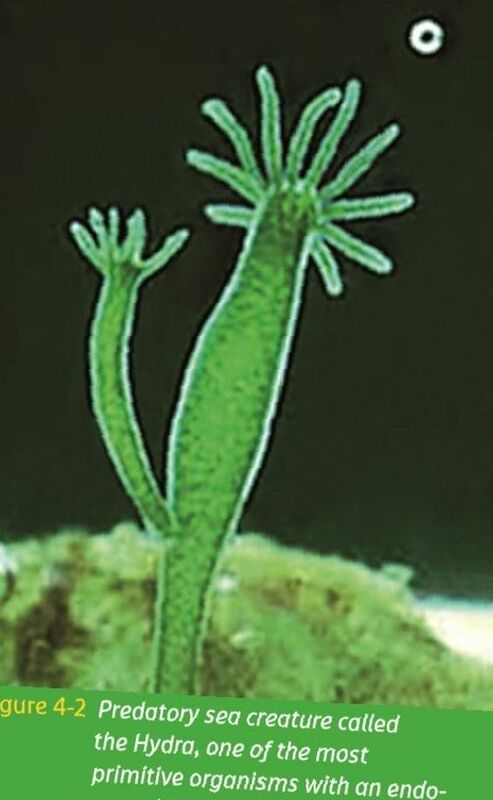 This cannabinoid signaling system is present in almost every imaginable animal life form, ranging from humans to cats and birds, down to fish and even primitive sea creatures such as the Hydra (see figure 4-2). This finding shows the evolutionary importance of such a system for basic survival and functioning of species. It should be noted that not all of the effects of cannabinoids can be explained by receptor-binding alone, and it is believed that at least some effects are caused through other mechanisms. In pharmacology, the term mode of action refers to the specific biochemical interaction through which a drug substance produces its medicinal effect. So, an important question is, how can substances from the Cannabis plant help in combatting different diseases; what is its mode of action? Scientific studies clearly show that endocannabinoids play an important role in keeping our bodies balanced, especially during a state of illness. One cannabinoid researcher described it in this way: the endocannabinoid system helps your body to “feel less pain, control your movement (spasms), relax, eat, forget (posttraumatic stress), sleep and protect your nervous system”. It has now been scientifically established that the cannabis plant produces substances called cannabinoids that can interfere with our endocannabinoid system. This interaction provides many opportunities for treating difficult diseases and for the development of new medicines. In other words, the endocannabinoid system presents a set of new pharmacological ‘locks’ that can be opened or closed with the help of natural or synthetic cannabinoids. This is exciting information, butit is not entirely unique; just think of the opiates (morphine, codeine etc.) that are produced by the poppy (opium) plant. These opiates interfere with our system of opioid receptors, which are part of our nervous system and are meant to help us deal with intense pain, danger and other forms of severe stress. Thanks to scientific study of the poppy plant we have access to potent painkillers and anesthetics that help us get through a surgery or severe accident. Thus, turning a narcotic plant into valuable medicine has been done before, and cannabis may follow the same way to modern medicine. External cannabinoids, present in the cannabis plant, are able to interact with our internal endocannabinoid system and cause a variety of effects. However, cannabis is a potent medicine and may not be suitable for all patients. In some cases (depending on e.g. cannabis variety, dose and administration form), the effects may be therapeutic, while under other conditions unwanted effects may occur. When too much is consumed a state of intoxication will occur. Although for some people this may be pleasant and even part of the therapeutic effect, concerns have been raised about the potential for longterm cannabis consumption to increase risk for schizophrenia, psychosis, bipolar disorders and major depression. In some way you could say that recreational users of cannabis are purposely overdosing a medicine, because they like the side-effects of it. By looking at the issue in this way, it may be easier to see the difference between medicinal use and the recreational use of cannabis. The terpenes may be involved in all this in several possible ways: by helping cannabinoids to cross from the blood stream into the brain, or perhaps by changing the binding of cannabinoids to their receptors. Some terpenes also have their own effects, completely independent of the cannabinoid receptors. However, there are too many terpenes and too many different modes of action to discuss them all here. At present various studies have shown that whole plant preparations of cannabis often have a better medicinal effect than just THC alone. The way all the cannabis compounds work together to cause a medicinal effect is called synergy. More research is needed to fully understand how these interactions works.